While thinking about our prompt of “heroes or villains,” a mischievous kitty cat came to mind, which could be either one really, so that’s what we ended up with today. I’ve mentioned my cat allergies before, but I still adore them and love sketching them as it’s always like getting a kitty of my very own, if only virtually. And I adore watching cats play, from a safe distance, of course. They seem so intent on what they’re doing, even if what they’re doing is a bit naughty and not something their owners think they should be doing. When it’s time for a bit a play, cats are seriously focused. In many ways, I feel like a cat when I’m sitting down to make my little doodlewash each day. I scribble my outline and then doodle around it with a pen and erase the pencil. Then I start splashing some color in and bat that around like a ball of yarn. While I’m doing so, I achieve a level of focus that I lack much of the rest of the day. It’s a zone where I’m intent on having a wonderful time and enjoying the moment as it happens. Not the “process” as I don’t really have a strict one of those, but simply the moment itself. It’s a magical moment where a blank sheet of paper gets transformed. That awesome and heroic moment where a villainous little kitty cat prepares to attack an innocent plush animal right there on a page of my sketchbook! It’s indeed a bit strange to be allergic to an animal you resemble so much. While I’d love to think I’m a cuddly puppy, in so many ways, I’m a finicky cat instead. I enjoy the company of others, but also quite happy just being off on my own and in my own little world. Perhaps that’s why I enjoy sketching cats. There’s a kindred spirit there that I just can’t quite explain. But, I have to admire such focus when it comes to playing around. That’s the trait that cats and I share, and I cherish. 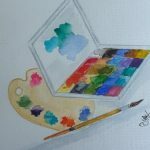 I’ve mentioned before that I’m not a watercolor painter, this is a completely different sort of discipline and one I absolutely love, so I promote it as much as possible on this site. Seriously, if you haven’t looked through the archives of all of the amazing watercolor painters on this site, stop reading this drivel and DO check them out now! My own approach is simply taking a sketch and coloring like one might in a coloring book. Just like I did when I was a kid. For me, it’s a moment to shake hands with my inner child and follow my heart. My heart just wants to sketch and color, so that’s what I DO! Yet, every little approach to color and blending has been influenced by those awesome master teachers who have inspired me! So, sure, I still just color in my sketchbook, but those amazing artists taught me everything I know, so please check out their classes! What I adore most about this art journey is that I can soak up all of the wonderful tips and tricks that I find and apply them in a way that’s unique to me. This uniqueness is quite impossible to avoid as each of us possesses a beautiful and very unique talent. So, if you like what I make and would like to paint like me, then that’s rather easy. Just embrace your inner child and hand that paintbrush over, forgetting any of the adult rules you might have in your head. I’m so thrilled when people enjoy my coloring pages. I’ve spent the entire existence of this site celebrating the wondrous things that watercolor can achieve and I’m honored to have featured some of the world’s most amazing artists. This has been a lesson in humility as I share so much work that is far superior to my own skills. But, each time, I learn a little something in the process and I hope you do as well. My heroes, when it comes to watercolor, inspire me each and every day. I don’t have the patience or time to create what they made happen, but that never stops me from showing up with my own quick little doodlewash version. Some day, I’ll make that large scale watercolor painting, but for now, I’m quite happy just showing up each day for a bit of serious play. Join Us For The March 2019 Art Challenge! Da Vinci Paint Co.: Yellow Ochre, Terra Cotta, Opus (Vivid Pink), and Cobalt Blue. Lamy Al-Star Safari Fountain Pen with black ink in an A5 Hahnemühle Watercolour Book. Want to purchase a print of this doodlewash? Send me a note with a link to this post, and I’ll add it to my shop! Potato, Watercolor Po tah to. You are an artist with a wide range – writer, actor, musician, painter. Watercolor is just one of the mediums you happen to use. And, like most things I suspect, you use it with flair! Yay, Peevee! 😃💕So thrilled you enjoyed this! Cute kitten! I do love my cats even though I just chased one away because he was being a nudge! One of my art hobbies was weaving. I used big looms in a studio that was in a converted barn. It was amazing to see all of the fabrics produced by the artists. So many patterns and colors and objects. I was always most interested in color. I have a beautiful multicolored rug I made, and a cape in purple that I still wear. My gardens are like that too. I’ll never be one for a relaxing and harmonious yard. I need a riot of color, especially hot reds, yellows, and oranges. This past summer, for the first time, I grew a wild flower garden filled with poppies. It was a glorious thing full of color, and changing every day. I love the life of the painting and your wonderful words, “That awesome and heroic moment where a villainous little kitty cat prepares to attack an innocent plush animal right there on a page of my sketchbook!” It opens the door to a magical world. Your ‘daily habit’ makes every day special for each person who visits your space. Both the painting and the writing create a sense of joy and freedom. Thanks, Sarah! 😃💕You always make me happy with your confirming comments. I have to admit that I’m the watercolor wild child. I don’t do things like everyone else and sometimes I wonder where my place might be in everything. But, I’ve learned in life that you just have to make your place no matter what! The wonderful use of color and marks in the cat’s fur sure looks like a painting to me! Thanks so much, Sharon! 😃💕 hehe… I can assure it’s just clever coloring made to look like a painting, but that’s my game! lol And it’s so much fun! I completely agree with Sandra Strait about your wonderful skill sets. I do think that you render certain things very well like glass, metal etc..also you are not shy in using bold colours like Opus…I love the contrast in your paintings that you have managed to achieve….These are not small things but steps in the right direction..Your paintings are a lot more than coloring pages..Donot be so harsh on yourself.. Thanks, Anita! Oh, you misunderstand, I’m overjoyed to think of them as coloring pages! hehe 😃💕 That’s exactly what they are! And I think that’s what makes it so much fun to show up each and every day. I don’t labor all of the techniques, pigments, etc, that go along with watercolor painting. I just illustrate and color. Though I will one day try true watercolor painting as it’s phenomenal!! I just make a doodle and wash it! hehe… yet I find it so freeing and fun! Thanks so much, Lori! 😃💕I’m drawn to every single approach to watercolor like a moth to a light bulb. It’s all so magical and awesome! I hope to learn so much more in the future. But, I’m happy taking everything one little step at a time! I so love this. As I read this I have a cat sitting on my lap, and not being a nudge for once. I love being prompted by your “Doodles” as it gives the the discipline I need to expand with paints and also to expand with my own ideas for the painting. I sketch quickly, paint and then have given myself permission to use pen instead of painstakingly producing every shadow or dark area with a wash or brush-stroke. I’ll leave that for a bigger, longer painting. Once during a class I signed my painting with ink and the instructor told me it was no longer a watercolor painting, but multi-media. Since that was the only input on my painting I didn’t go back. I’m having fun with your site. You captured a delightful moment. What a beautiful kitten..looks just like our first cat Sadie….she was truly hero and villain. Thanks, Mary! 😃💕 hehe… yay! Glad this reminded you of Sadie. I think all pets are part hero and villain and that’s precisely why we love them. I’m allergic to cats too, or I’m sure I’d be a cat lady. Luckily there are plenty of feral ones around to keep an eye on. A wonderful painting and story. The cat is so very cute with his concentrated look. The little bear is sweet too. I love your style of painting. It’s fun, and shows how very talented you are. You’re so sweet! Thanks, June! 😃💕 That’s such a lovely compliment. So happy you enjoyed this doodlewash and story! just when I could use a dash of doodle-ispiration! 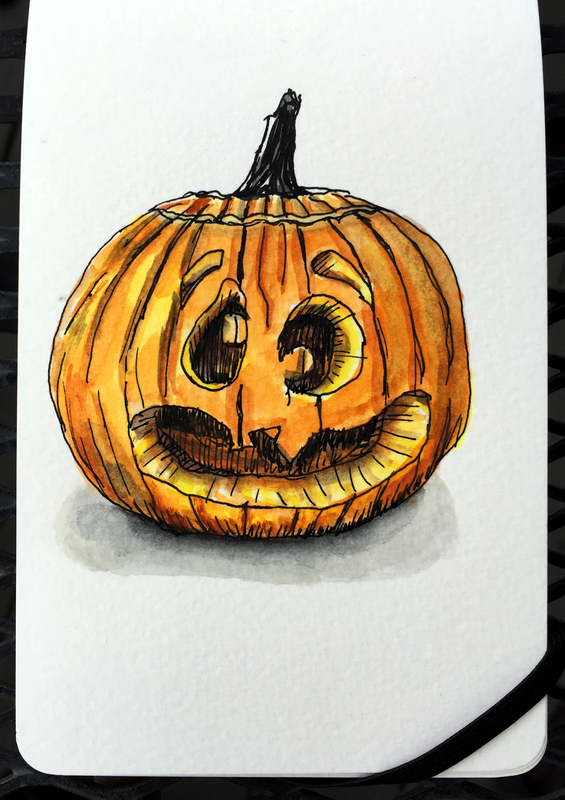 Love DoodleWash and am looking forward to your posts and the daily prompts! Bat the color around like a ball of yarn – you made me laugh out loud, Charlie, so thank you very much. You caught the essence of cat-dom: seriously focused on play, just one step away from hunting – which is their instinct, of course. Please stop apologizing for your level of artistry. You are an outstanding artist. In fact, I’ve been thinking that you could create an entire career painting animal portraits. People would LOVE them. Something to think about for when you retire – 100 years from now. Thanks so much, Sharon! 😃💕What you’re reading isn’t so much an apology as making my mark. 😉 I adore watercolor painting and I feature it as much as humanly possible, but I’m more of a coloring book artist and have created different expression of the medium. I doodle an image and then color it! hehe… it’s fun and expressive in it’s own right, but it’s definitely different than traditional watercolor painting. I not really sure what defines artistry. In a traditional sense, it’s defined by patrons. But, I think anyone who makes something people enjoy is indeed an artist. So happy you enjoy what I make!